The Acer Chromebook 514 was announced at IFA 2018 in Berlin. Android Police pointed out that there are two different SKUs for the Chromebook 514. One SKU is for the Chromebook 514 with a multi-touch display (with Android app support) and one is without. The multi-touch display version has a better processor, more RAM, and more storage. The Acer Chromebook 514 has a starting price of $349.99. And it seems likely that the multi-touch display version will cost a bit more than that. The Chromebook 514 has a metal build, an HD display, and a quad-core Celeron processor so the price seems justified for what you are getting. But Android Police said that the Chromebook 514 seems to have “poor build quality.” There is a chance that this may have just been the case for the model on display at IFA as the Chromebook 514 is not available for the public as of yet. Note: This article will be updated once I get a chance to get my hands on the Chromebook 514. The good news is that the trackpad is encased with Gorilla Glass. And the trackpad is larger on the Chromebook 514 compared to other Chromebooks. And Android Police also said that there are issues with the keyboard as well. Even though the keyboard is tactile, it has too much movement once each key actuates. 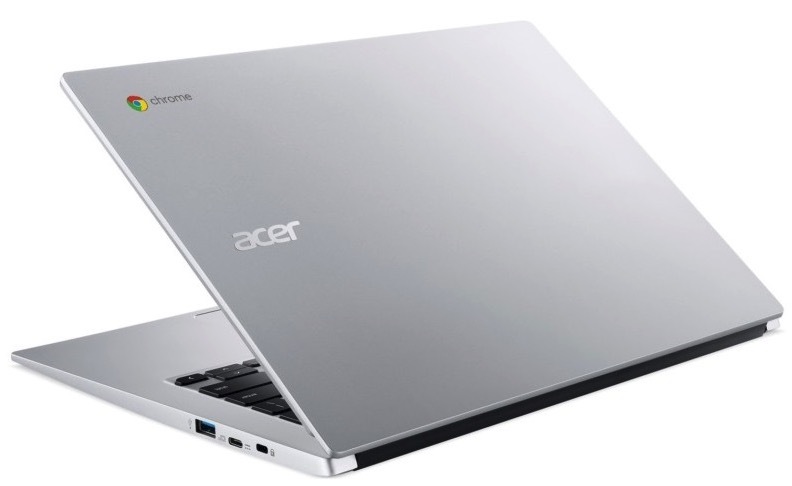 Inside of the Acer Chromebook 514 is an Intel Celeron Quad Core N3450 or the Intel Pentium Quad Core N4200 (both are in Intel’s Apollo Lake line) processor. The graphics processors are Intel HD Graphics 500 or 505. This is some respectable hardware especially when you consider the price of the Chromebook 514. The display is a 14” FHD Acer ComfyView IPS LED LCD or FHD (1920×1080) IPS multi-touch LCD. These are great displays especially considering the price point as well. Inside of the Acer Chromebook 514 is either 4GB of RAM or 8GB of RAM. This is a good amount of RAM needed for zipping through applications. The Acer Chromebook 514 has a battery life of 12 hours. This ensures that you can use the laptop for the whole day without requiring a charge. The number of ports built into the Chromebook 514 is also respectable. There are 2x USB 3.0 ports, 2x Type-C USB ports, a microSD card slot and a 3.5mm headphone jack. What is great about this specification is that you will not need to stock up a bunch of splitters and adapters. The storage is either 32GB or 64GB eMMC storage. This is a moderate amount as it does not seem like enough. But Chromebooks are known for working on files that are stored on the cloud anyway. If the design of the Chromebook 514 is as Android Police described, then it is at a disadvantage. It would have been better if the Chromebook 514 had a more sturdy design.